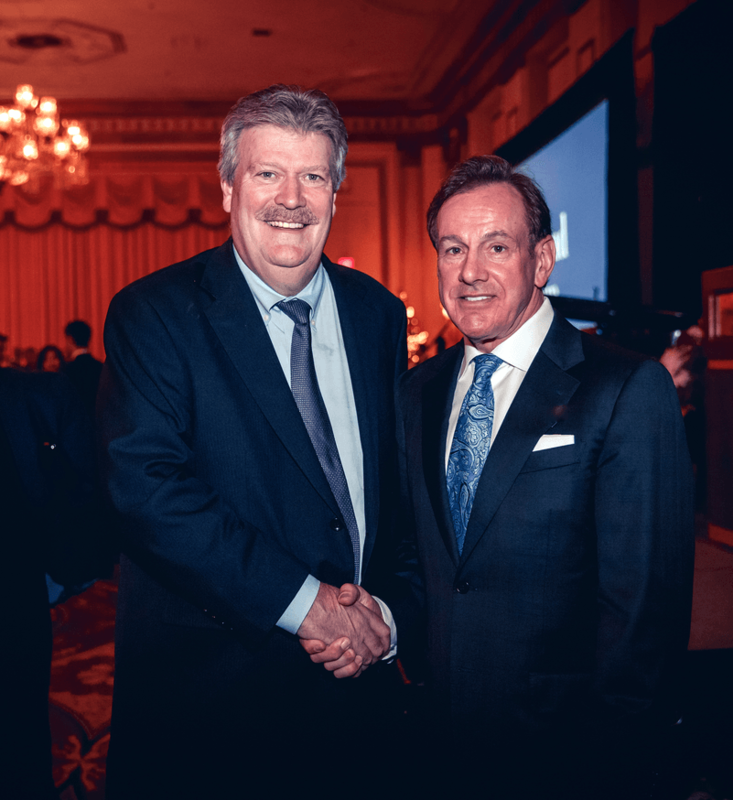 With the help of thousands of retail investors, real estate syndicator Kevin England has enjoyed an impressive career buying, fixing up and selling — sometimes decades later — higher-end apartment buildings in markets including Toronto and Dallas-Fort Worth. England is a very personable entrepreneur whose career has been defined by his ease in cultivating close relationships with investors through good performance and open communication. As he winds down his real estate business, England is channelling much of his abundant energy into a project he discovered through his greatest personal challenge: overcoming drug addiction. Until recently, The England Group controlled a portfolio of 12 Texas apartment buildings. The financial returns were looking positive and the investors were getting older, so England decided it was a good time to sell. England believed the buildings would fetch a higher sale price if assembled as a portfolio, so he convinced the roughly 3,200 investors in the 12 separate deals to come together. Each building was valued at the current appraised value and the overall portfolio was thought to be worth US$220 million. England had one other request of his investors. He pitched that if the final sale price for the portfolio was more than $20 million above the appraised value, the investors would give one percent of total proceeds to B.C. New Hope Recovery Society, a non-profit chaired by England and founded by former MLA Lorne Mayencourt. The society operates Baldy Hughes, a therapeutic addiction treatment community and farm near Prince George, B.C. Baldy Hughes is a unique treatment facility that provides long-term treatment in a remote, therapeutic community setting. It is free, and residents participate in a rigorous year-long program – enough time to regain their physical, psychological and emotional well-being and learn new skills. An overwhelming majority of The England Group investors agreed, and the Texas portfolio fetched US$288 million in late 2014, securing the donation. When England converted the US$2.88 million to Canadian dollars in early 2015, there was a substantial currency appreciation, and it was worth C$3.6 million. 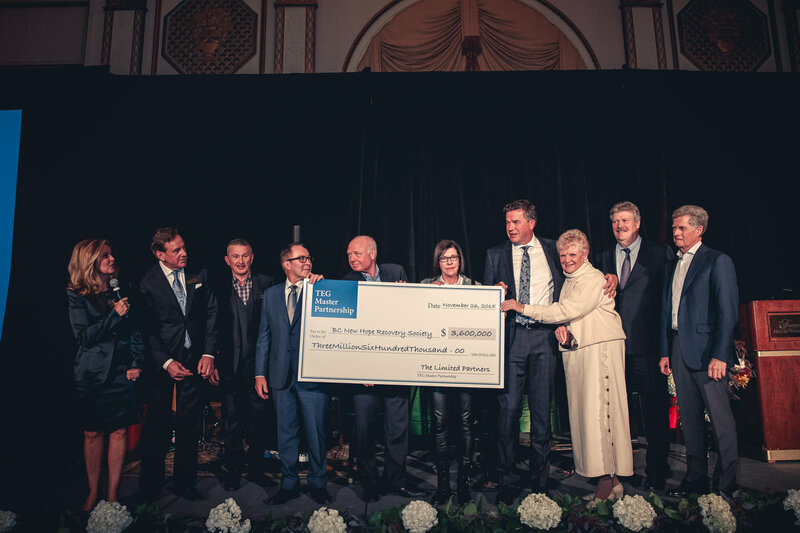 A celebration was held at the Hotel Vancouver on November 26 to recognize The England Group’s investors. B.C. Housing Minister Rich Coleman, media personality Pamela Martin and England himself delivered thanks. The crowd learned the donation will be invested to provide long-term cash flow for Baldy Hughes. The project grew out of England’s struggles with addiction – he kicked cocaine ten years ago after two attempts at rehab – and his desire to help others battling similar demons. During a recent interview in his office, England told me he learned about work ethic and values from his mom and dad, who raised nine children on dairy farm outside of Pembroke, Ontario. “I was boy number five so I was raised with a lot of hand-me-down clothes. That may have been a motivator – I always wanted to be successful,” England recalled. He graduated from Carleton University and got a sales job with IBM. England credits the technology company with teaching him to think about long-term client relationships. “Think of the big picture and not the immediate sale and you’ll do well,” he recites appreciatively from his days with Big Blue. England watched a few friends leave IBM and start successfully raising money for real estate investments. 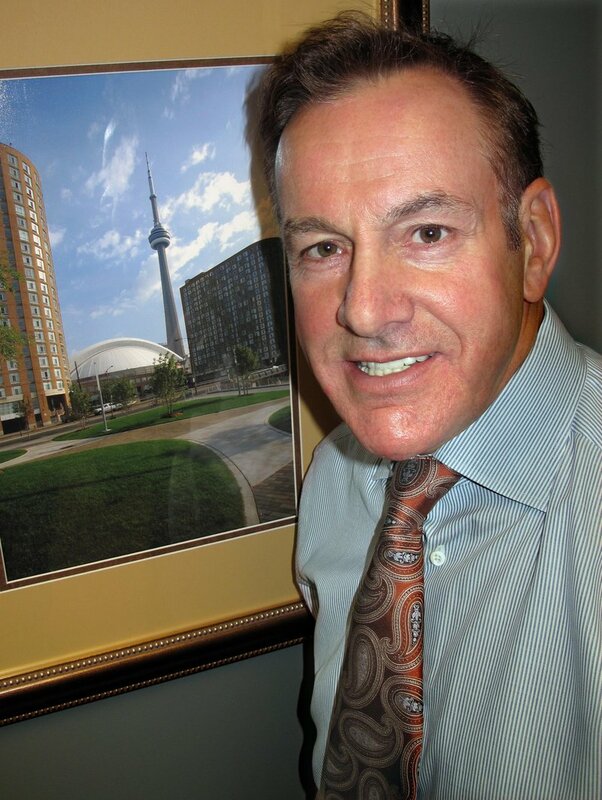 He soon followed and became syndications manager for Qualico, a real-estate investment firm. By the time Qualico exited the syndications business, England had built up a Rolodex of happy investors and the know-how to start his own shop. He launched The England Group in 1986. The England Group’s most active year involved the completion of three deals, which speaks to the company’s belief in thorough due diligence. The England Group enjoyed some spectacular successes. For example, in 1996 England acquired Maple Leaf Quay, a 500-unit apartment building on downtown Toronto’s waterfront, for $42 million with $14 million down. The asset paid rents for 17 years before fetching $150 million on a sale in 2013. Then there was Lakeview Place in Mississauga, a 180-unit property. England put $3 million down to buy it for $12 million in 1996 and sold it recently for $52 million. 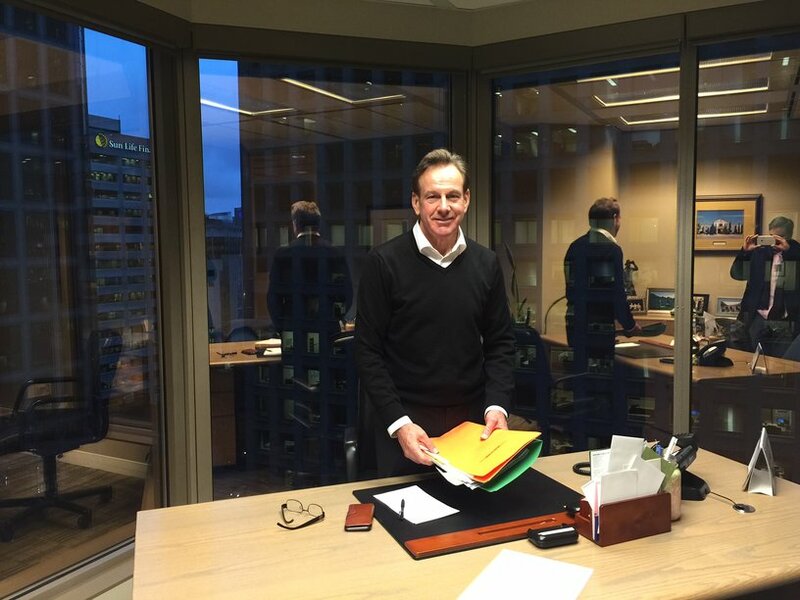 England financed his projects with the support of independent financial planners who presented the deals to their clients. However, this strategy may not be available to future Canadian-based real-estate syndicators. England’s voice lowered as the conversation moved from real estate to his own struggles with addiction and Baldy Hughes. Friends from a peer group persuaded England to get help. His first attempt at rehab, a 30-day program in Toronto, wasn’t enough for him to maintain long-term sobriety, and he relapsed. In 2006 England tried for a second time, this time a 60-day program on Vancouver Island. He has been clean ever since. While recovery was slow, England says he is much stronger now for having gone through the experience. A visit to the world-renowned therapeutic community in San Patrignano, Italy convinced England that a similar, long-term treatment program was needed at home in B.C. England believes that the longer you spend in treatment, the better chance you have of staying sober. As chairman of B.C. New Hope Recovery Society, he helped find the Baldy Hughes property outside of Prince George and negotiated favourable lease terms with the owners. In late 2010, BC Housing acquired the property and entered into an operators agreement with the Society – providing stability and long-term security to the project. Eight years later, more than 650 people have received treatment at the 63-bed facility. “These guys just grab you and it’s an amazing process to watch,” he says. England’s real estate syndication days may be behind him, but he’ll still be raising money for projects he believes in. 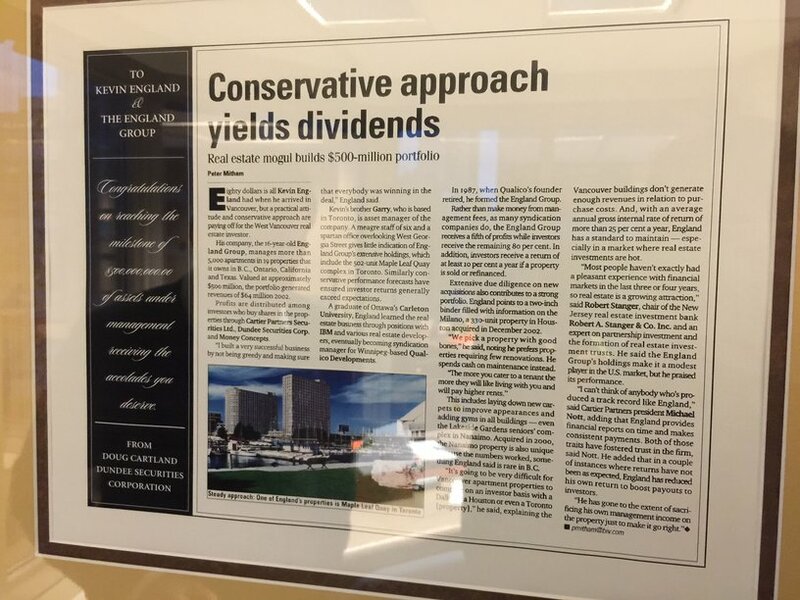 Congratulations to The England Group and all its investors, B.C. New Hope Recovery Society and Baldy Hughes, and to all those who embrace corporate giving. PS – Join chat.ceo.ca – the investment conference in your pocket and download the CEO.CA app for iOS and Android.